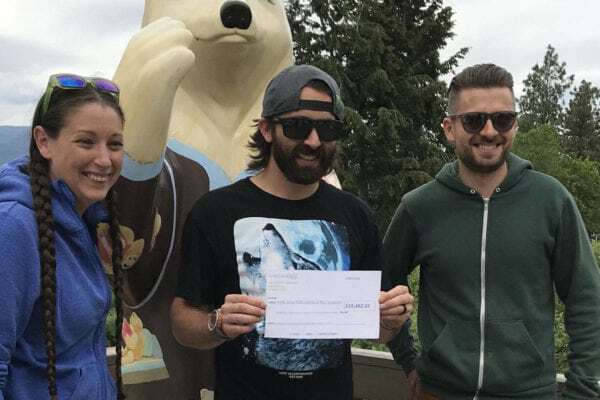 The Clearwater Sno-Drifters Snowmobile Club and local snowmobile X-Games gold medal winner Brett Turcotte and his wife Niki presented a check to Easter Seals last week, with funds raised for children and families who stay at Easter Seals Camp Winfield and Easter Seals House in Vancouver. The amount was $19,482.55, which was raised in March ​during the Snowmobile Drag Race and Freestyle show organized by the Turcottes. “My wife and I put the idea together to bring the community together and give back,” said Turcotte. Crystal Durnin from the BC Snowmobile Federation and Brett and Niki Turcotte traveled to Camp Winfield last week to present the funds to James Gagnon, Director of Camp Programs and Facilities at Easter Seals Camp Winfield.